What Can You Clean With Ryobi 2800? Ryobi Tools represents a major competitor in the field of power tools and gadgets. As a manufacturer of all sorts of tools, Ryobi is well known for its pressure washers. They offer units that can fit all your cleaning needs, from medium-duty electric ones to the mightier gas heavy-duty power washers. We will focus on a gas-powered model, the Ryobi 2800 PSI, which is one of the strongest models that this company has to offer. We hope that this Ryobi 2800 review will prove useful if you want to learn more about this particular model and decide to buy it. This cleaning unit has a powerful GCV160 Honda gasoline engine which produces 2800 PSI at 2.3 GPM, which means it has a total cleaning power score of 6440. Keeping in mind the considerable force this power washer can put out, we have decided to test it on various surfaces and in multiple cleaning scenarios. Designed as a true power tool, the Ryobi 2800 gives the impression of a mighty machine at a first glance. The Honda GCV160 engine is mounted on a steel frame with the exhaust located on top of the washer. The frame also serves as a carrying handle, but keep in mind that all gas-powered pressure washers come at a price: weight. This unit weighs a total of 56 pounds, making it a bit heavier than the electric-powered models, and not so easy to carry around. Luckily, the whole pressure washer frame is mounted on two big plastic wheels that will help you with maneuvering. Now, when it comes to cleaning, this model offers you the option to change the pressure by turning the gauge knob on the spray wand. This is a quite important property to have, considering that power washers can damage more sensitive surfaces. The wand is connected to the washer with a 25-foot long high-pressure hose, which is more than enough to help you reach more challenging places that you want to be cleaned. To make your cleaning sessions even more convenient, Ryobi included four different quick-connect detachable spray nozzles. Besides the angled ones (0, 25 and 40-degrees), there is a soap quick-connect nozzle that works great combined with the onboard detergent tank. With it, you can tackle the most stubborn stains. Ryobi Tools, along with Ryobi Nation, made sure you never run out of ideas for your backyard projects. They created a community of power tool enthusiasts who share their knowledge on the platform. Even if you are completely new to DIY, you will manage to find useful tips and tricks to make your cleaning more interesting. You can also check the user guide anytime. The company offers a 30-day guarantee period as a safety net, and if you decide to stick with your power washer, they provide a 3-year warranty for the unit and the Honda engine. Considering that this is a gas-powered power washer, its limitations are quite hard to find. In contrast to the less powered electric models, this unit exerts a mightier punch. This model was tested on glass, wood, marble, metal, stone and concrete surfaces and it withstood the challenge of any stain presented. Dirt, moss, leaves, rust, old paint, oil stains – you name it. 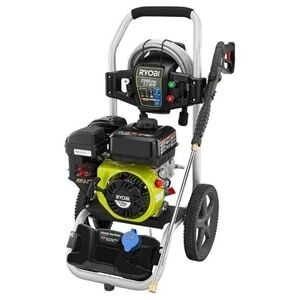 This model would be ideal for cleaning old driveways and even greasy old grills and similar equipment. The Ryobi 2800 is quite powerful, and its Honda engine is praised for being consistent in every situation. The gauge control is absolutely wonderful with its versatility and all-around possibilities. There is also the lack of power cords, which allow you extra mobility despite the fact that it weighs a bit more than the most other electric pressure washers. This model is a bit bulky and sturdier, so keep in mind that you will have to sacrifice a bit of portability for the sake of power. If you want to have a real power tool in your arsenal, this model is maybe one of the best from what Ryobi has to offer. The results that this unit provided were consistent and solid, with little to no problems along the way – the only problem was the weight. If that could be considered a problem since it’s more of a nuisance really. The adjustable pressure output is quite handy, and long power cord gets you anywhere you have to go in order to get rid of those nasty stains that have been piling up. Plus, there is the feeling of owning your own power washer, considering the fact that renting one is not a cheap endeavor. We hope that we covered everything there is to know in this Ryobi 2800 review, and, of course, feel free to post all additional questions and concerns in the comment section below.